The iconic Swedish car brand Saab was popular in many European countries for a long time. The Saab cars are generally very solid and have a simple but functional and solid styling, which appeals to a large target group. Although Saab does not make any cars anymore, there are still many people with a car of this brand in their possession. The windscreen replacement of a Saab 9-3 or one of the other models is therefore regularly needed. There are many ways in which glass damage can occur. Unfortunately it is often not possible to repair the car windows and therefore the Saab 9-3 windscreen replacement may be unavoidable. However, this does not have to cost you the main price, because by purchasing after market automotive glass you are a lot more favourable. More about Saab and the best way to replace the windscreen of a Saab 9-3 can be read in this article. Where many European car makers are greatly troubled by the Second World War, this is precisely the period in which Saab was born. In neutral Sweden, Svenska Aeroplan AB (SAAB) was founded in 1937. Initially, this company only focused on the production of military aircraft. This would enable Sweden to retain its neutral position and, moreover, to make money from those countries that were at war. When the war ended in 1945, the demand for fighter planes had become so small that Saab was looking for a new market to produce for. That year, 1945, saw the creation of Saab's automobile division. they made was the 91 and so the first car was the Saab 92.
followed in the 50s and 60s. The real great success came with the Saab 96. This model was the first Saab car that was sold a lot outside of Sweden. With more than 550,000 copies sold, the Saab 96 was a resounding success. The Swedish Scania, too, was attracted to Saab because of the major foreign successes of the automaker. With the Saab 96 and the subsequent Saab 99, the company had become a renowned brand throughout Europe with excellent sales figures. Scania and Saab therefore continued together as Saab-Scania AB in 1969, so that both companies could benefit from each other. Of all these cars, the Saab 9000 was the model with the worst sales figures. More success was achieved with the Saab 900, which was released a few years earlier, in 1978. This car became the symbol of Saab, and with more than a million copies sold it was a huge success. Moreover, this car is also the basis for the Saab 9-3. General Motors gets in and the Saab 9-3 appears. In 1989, the giant American company General Motors joined Saab. The Swedish car brand has now been separated from the parent company Saab-Scania and the Americans take over 50% of the shares. This initially resulted in a new version of the Saab 900 in 1994. This new version of the classic Saab model shares many parts with the Opel Vectra of that time and is a great success, just like its predecessor. In 1997 the Saab 9-5 appears as a replacement for the Saab 9000. A year later, in 1998, the Saab 9-3 goes into production. The first generation of this car, which would remain in production until 2014, is effectively a facelifted version of the Saab 900 and thus a continuation of the most successful model of the Swedish company. Very special about the Saab 9-3 is that this model is made under no less than three different parent companies. 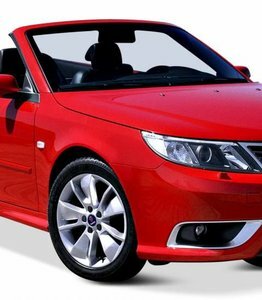 The windscreen replacement of your Saab 9-3 may be necessary with a car made by General Motors, Spyker or NEVS. Indeed, although GM decided in 2000 to take over Saab in its entirety, the company's situation is deteriorating. As a result, GM will sell the car brand to the Dutch company Spyker in 2010. This is not a success either and in 2012 the Chinese company National Electric Vehicle Sweden will take over the car brand. Throughout this period, the Saab 9-3 will remain in production and will be marketed for several generations. It does not matter for which kind of Saab 9-3 you want to replace the windscreen. For all generations you can find the right car windows here. It is a pity that the car is no longer in production at the moment. The current owner, NEVS, had to stop production of the Saab 9-3 in 2014 due to financial problems, and so at least for the time being this iconic car has come to an end. Withdrawing the Saab 9-3 from production also put an end to Saab as a car brand, because this was the only model still made after NEVS took over the company. Replacing your Saab 9-3 windscreen may be necessary for a variety of reasons. It often happens that rubble cause damage. Although this may be an asterisk at first, it can quickly develop into a crack. In that case, the windscreen replacement of your Saab 9-3 is often necessary to get back on the road safely. Another common cause is that the car window is smashed in by vandals or thieves. The broken car windows will then have to be replaced by new ones. The windscreen replacement of a Saab 9-3 was often carried out by a brand dealer. Although these do no longer exist, there are still certified garages where the Saab 9-3 windscreen replacement is possible. Here, however, you will have to pay considerably more than you pay through us. This is because only these car companies are allowed to sell windscreens with a brand logo. As a result of this monopoly position, they are charging higher prices than necessary. By opting for after market automotive glass you will not be bothered by this. These may also be sold by non-brand dealers. The competitive position ensures that the price for you is considerably lower. Replacing the car window without insurance is also possible due to the lower prices. The windscreen replacement of your Saab 9-3 can be a complex and precise task. When you can do this yourself, it is fortunately possible to order the car windows and any accompanying rubbers and frames directly and to replace the car window itself. For those who do not have this knowledge in-house, our FOCWA certified partners are the ideal choice. They even come on location to replace the windscreen of your Saab 9-3. Also in this case the prices are very favorable for you. Discover here the possibilities we offer to help you get back on the road safely and quickly.